Search by member Blanchet Concrete Pumping, LLC 24.7 Crete Pump, Inc. 4T Concrete Pumping 5-Star Concrete Pumping, Inc., a Div. of Trans-Fleet Concrete, Inc. 5-Star Concrete Pumping, Inc., a Division of Trans-Fleet Concrete, Inc. A & R Concrete Pumping, Ltd A Anthony & Son's, Inc. A Folino Construction, Inc. A-1 Pumpcrete, Inc. A-1 Pumping, Inc., dba, Martin's Concrete Pumping A-Star Concrete Pumping, Inc. A-Tech Concrete Company, Inc. A.A. Pittman & Sons Concrete Company Inc. A.J. 's Concrete Pumping AAA Concrete Pumping Services, Ltd AAA Concrete Pumping, LLC AAA Zoellner Materials ABI Corporation Ace Material Placing, Inc. Ace Ready Mix, Inc. Ace/Avant Concrete Construction Action Supply, Inc. Adam King Advance Equipment Co. Advance Ready Mix Limited Advanced Pumping, LLC Advanced Pumping, LLC AE Com Agassiz Concrete Pumping, Inc. Air Pump, USA AJ Concrete Pumping II, Inc. AJay Concrete Pumping Alewelt Concrete Alexander Wagner Co., Inc. All Island Concrete Pumping All Star Concrete Pumping Allen Concrete Pumping Alliance Concrete Pumping, LLC Alliance Concrete Pumps USA, LP Alliance Concrete Pumps, Inc. Allied Concrete Pumping Allied Concrete Pumping Almeida Concrete Equipment, Inc. (Dist) Almeida Concrete Pumping and Equipment, Inc. Aloha Equipment Rentals Alpine Concrete Pumping AM Placement Services Amcrete Concrete Construction American Alliance Drug Testing American Concrete Pumping Co. American Concrete Pumping Co., Inc. American Concrete Pumping, Inc. American Concrete Pumping, Inc. American Society of Concrete Contractors American Standard Concrete Pumping Hawaii Andersen Concrete Pumping Andrews Equipment Company, Inc. Andrews Equipment Company, Inc. Angeles Concrete Pumping, Inc. Ann Arbor-Jackson Concrete Forming Anthony Biddle Contractors Anthony Franco Apex Concrete Pumping Systems, Inc. Ardex Engineered Cements Arrow Constructions Art's Concrete Pumping Ashmore Concrete Pumping, LLC Ashmore Concrete Pumping, LLC Associated Interiors, Inc. ATCO Concrete Products N.V. Atlantic Concrete Association (ACA) Atlantic Concrete Pumping Enterprises Inc Atlantic Pumping, Inc. Atlas Concrete Pumping, Inc. Augusta Ready Mix, Inc. Aurora Concrete Pumping, Ltd Austin Commercial Equipment Division Austin ServAll Concrete Autocar Industries, LLC AVR, Inc. B & B Concrete Pumping B & F Concrete Pump, Inc. B & W Foundations B & W Rental, Inc. B. Pietrini & Sons Badger Swimpools, Inc. BAIR Inspections and Repairs Baker Equipment & Materials Bancroft Concrete Pumping Bangma Concrete Pumping, Ltd Barney & Dickenson, Inc Barron Pumping Services, LLC Bartley Concrete Pumping BASYS Processing Inc. Bauman Landscape and Construction Bayou Concrete Pumping, LLC BDS Concrete Pumping, LLC Beaver Creek Pumping, LLC Belfast Valley Contractors, Inc. Berkeley Concrete Pumping Berry's Concrete Pumping, LLC Big Creek Construction Big Johnson Concrete Placement, LLC Blake Hershberger Enterprises Blalock Lumber Company Blanchet Concrete Pumping, LLC-Laurel, MD Blanchet Concrete Pumping, LLC-Richmond/Tidewater Area Blanchet Concrete Pumping, LLC-VA Bloomington Concrete Pumping Blue Hat Crane BMF Equipment Services Bob's Concrete Pumping, Inc. Bob's Concrete Pumping, Inc. Bob's Concrete Pumping, LLC Boring Concrete Pumping, Inc. Bradford Concrete Pumping Bremik, LLC - Concrete Pumping & Conveying Brewster Pumping, LLC Briegan Concrete, LLC Brothers Concrete Pumping Service, Inc.-FL Brothers Concrete Pumping, Inc.-AR Brulez Concrete Placement Brundage Bone Concrete Pumping-AZ Brundage Bone Concrete Pumping-CA Brundage Bone Concrete Pumping-CO Brundage Bone Concrete Pumping-CO Brundage Bone Concrete Pumping-GA Brundage Bone Concrete Pumping-ID Brundage Bone Concrete Pumping-KS Brundage Bone Concrete Pumping-MO Brundage Bone Concrete Pumping-OK Brundage Bone Concrete Pumping-OR Brundage Bone Concrete Pumping-SC Brundage Bone Concrete Pumping-SC Brundage Bone Concrete Pumping-TX Brundage Bone Concrete Pumping-TX Brundage Bone Concrete Pumping-TX Brundage Bone Concrete Pumping-UT Brundage Bone Concrete Pumping-WA BSM Technologies Buckeye Concrete Pumping, Inc. Bulls Eye Material Placement Burbidge Concrete Pumping Burgess Concrete Construction, Inc. BURNCO Rock Products, Ltd BURNCO Rock Products, Ltd BURNCO Rock Products, Ltd BURNCO Rock Products, Ltd Burton, Robinson & Poland, Inc. Busbee Concete Services, Inc. C & C Concrete Pumping C & C Industrial, Inc. C & C Pumping Services, Inc. C & R Preferred Concrete Pumping, LLC C & S Concrete Pumping, Inc. C F & T & Available Concrete Pumping C&S Concrete Pumping, LLC C-Tech Construction, Inc. Cagle Brothers Concrete Pumping, LLC Calco Concrete Pumping, Inc. California Concrete Pumpers Alliance CALPORTLAND Cambridge Concrete Pumping Canandaigua Concrete Cancrete Equipment Canyon Contracting, Inc. Capital Pumping, LP Capital Pumping, LP Capital Pumping, LP Capital Pumping, LP Capital Pumping, LP Capital Pumping, LP Capital Pumping, LP Capital Pumping, LP Capital Ready Mix Capitol Concrete Pumping Inc Carroll Concrete Caruth Concrete Pumping Caruth Construction Case Pacific Company Castle Concrete Pumping, Inc. Castle Concrete Pumping, LLC CCK Construction Services, Inc. Cecil Whiteley Concrete Pumping Cemstone Products Co. Central Concrete Pumping Central Concrete Pumping-Fort Worth, TX Central Concrete Services, Inc. Central Florida Concrete Pumping, LLC Central Illinois Conveying & Pumping Central Missouri Concrete Pumping Certified Boom Repair Services, Inc CES Appraisal CFS Forming Structures Co., Inc. Challenge Concrete Pumping, a Division of Lehigh Hanson Materials, Ltd Champion Concrete Pumping, Inc. Champion Concrete Pumping, Inc.-MT Charger Concrete Services Chavez Concrete Pumping, LLC Cherokee Development, Inc. Cherokee Equipment Sales, LLC Cherokee Pumping of Florida, LLC Cherokee Pumping, Inc. Cherokee Pumping, Inc. Christman Constructors City Concrete Pumping City Pumping, Ltd Coastal Carolina Pumping, Inc. Coastal Carolina Pumping, Inc. Coastal Carolina Pumping, Inc. Cobijar Consulting Co., Ltd Cole & Lambert, Inc. Cole & Lambert, Inc. Coleman Concrete, Inc. Colorado Concrete Pumping, LLC Combined Concrete Pumping (2007), Ltd Command Concrete Pumping, LLC Commercial Capital Company, LLC Commercial Fleet Service, Inc. Complete Concrete Restoration, Ltd Conco Pumping and Belting, Inc. Conco Pumping and Belting, Inc. Conco Pumping and Belting, Inc. Concord Concrete Pumps International, Ltd Concrete & Materials Placement, LLC Concrete & Materials Placement, LLC-Charleston Concrete & Materials Placement, LLC-Columbia Concrete & Materials Placement, LLC-Greensboro Concrete & Materials Placement, LLC-Myrtle Beach Concrete & Materials Placement, LLC-Raleigh/Durham Concrete Equipment Inc. Concrete Equipment Zone Concrete Foundations Association Concrete Placement, Inc. Concrete Placement, Inc. Concrete Pump Dispatch, Inc. Concrete Pump Inspections Concrete Pump Partners Concrete Pump Partners Concrete Pump Repair, a Schwing Company Concrete Pump Supply Concrete Pumping Association of Australia Concrete Pumping Depot, dba Ainsworth International, LLC Concrete Pumping, Inc., dba, CPI Concrete Pumps USA Concrete Strategies, LLC Concrete Systems Pumping, LLC CONCRETEIRON.COM Conpump, Ltd Construction Drilling Equipment Construction Forms, Inc. Construction Forms, Inc. Continental Bank Cornerstone Concrete Pumping, Inc. Cornerstone Contracting, Inc Cotton Inc. Cousineau Concrete Pumping Cova Concrete Pumping Cowboy Concrete Pumping, LLC CPE America, LLC CPE Machinery Pty, Ltd CPN, LLC Crete Concrete Cretor Construction Equipment, Inc. Cross Concrete Pumping Company Cross Concrete Pumping Company Cross Enterprises of Florida, Inc. CSG Construction, Inc., dba CSG Concrete Pumping CTR Concrete Pumping, Inc. Curtis Concrete Pumping Curtis Creek Concrete Pumping, L.L.C. Custom Concrete Pumping Custom Service Crane, Inc. CVC Equipment, LLC Cyclone Trucking, Inc. D H Concrete Pumping Co. D P Fuccillo, Inc. D. Classen Concrete Pumping D3 Concrete Construction, LLC Daeyoung Special, Inc. Dave's Concrete Davis Block Co. Inc. De Grandis Concrete Pumping Denis Lootens Dennis Grove Concrete Pumping, Inc. Dennis Grove Concrete Pumping, Inc. Desert Concrete Pumping DGI-Menard DIAI Insurance Brokerage, Inc. DICA Dillon Bros Ready Mix Concrete DN Tanks Double T Concrete Pumping Dryco Construction, Inc. Duce Concrete Pumping Duimering Concrete Forming, Inc. DY Concrete Pumps, Inc. Dynamic Concrete Pumping, Inc. Dynamic Concrete Pumping, LLC E-Con-Placer, Inc. E-Con-Placer, Inc. E.E. Gilbert Construction, Inc. East Coast Concrete Pumping, LLC East Elgin Concrete Forming East Sparta Pumping Easton Pool and Spa, Inc. Economy Concrete, Ltd Edward D. Lothamer, LLC Edwards Concrete Construction Element 51, Inc. Elite Concrete Pumpers, LLC Elite Pumping Services, LLC Eller Construction Elsea Construction Services LLC Enviro-Systems, Inc. Ernst Enterprises, Inc. Essex Concrete Corporation Everdigm America, Inc. Evolution Construction, LP Extreme Pumping, LLC F.A. Wilhelm Construction Fenix Construction First Midwest Equipment Finance Five Boro Concrete Pumping, LLC Flat Rate, Inc. Fleming and Sons Concrete Pumping, Inc. Florida Concrete Pumping Florida Concrete Unlimited, Inc. Florida Concrete Unlimited, Inc. Forcine Leasing Company Four Arrows Concrete Pumping Fritz-Pak Corporation Frontier Construction Supply & Concrete Pumping, LLC Frontline Concrete Pumping, LLC Gant Concrete Pumping Gant Concrete Pumping-Memphis Gemelli Concrete, LLC Gemini Concrete Pumping, Inc. Gemini Concrete Pumping, LLC Genesis Concrete Pumping, LLC George Thompson Georges Concrete Pumping, Inc. Gerald Fulghum Gib-San Pools, Ltd Glasrock Products, Inc., dba, Glasrock OMI Global Beton Equipment Inc. Global Beton Equipment, Inc. Glossners Concrete, Inc. GMS Golden Arrow Equipment, Inc. Gordy's Concrete Pumping Service, Inc. Graf Custom Construction, LLC, dba, Seneca Foundations Grand River Construction, Inc Great River Pumping & Coveying, Inc. Greater Lakes Concrete Pumping, Inc Greatland Concrete Pumping H.D. Construction Equipment, Inc. Hanover Concrete Company Hard Rock Pumping & Placement Harmer Concrete Pumping, Ltd Hat City Concrete Pumping, LLC Hawaiian Rock Products HBA Incorporated HC Matcon Heartland Concrete Placement, Inc. Henry C. Black Concrete Pumping Heritage Concrete Hernandez Concrete Pumping HFK Concrete Pumping Hi Tech Concrete Pumping Services Hillcrest Concrete Pumping, LLC Hite Concrete Pumping HKA Enterprises Hoosier Concrete Pumping, Inc. Hotz Concrete Pumping Howard Concrete Pumping, Inc. Howard Concrete Pumping, Inc.-IL Howard Concrete Pumping, Inc.-OH Hudson Valley Concrete Pumping, Inc. Hunter Concrete Pumping, Inc. Hydracrete Pumping Co., Inc. Hydro-Arch Ian Howe Concrete Pumps, Ltd Independent Concrete Pumping, Corp. INFERNO Concrete Pumping, Ltd Infinity Concrete Pumping, Inc. Infintech Ingram Concrete, LLC Inplace Pumping Co. Insulating Concrete Form Association Integrity Concrete Intermountain Concrete Pumping Interstate Concrete Pumping, Inc. Ironman Concrete Pumping Irving Equipment, LLC J M Briggs, Inc. J Nagy Construction J. L. Marshall & Sons, Inc. J.C.L. Concrete Pumping J.M. Pereira & Sons, Inc. Jackson Concrete Pumping Jay Dee Concrete Forming Jazz Concrete Pumping Jeff-Co Contractors, Inc. Jensen Concrete Pumping and Services Jensen's Concrete Pumping, Inc. Jernigan Concrete Pumping, Inc. JNJ Construction, Inc Johnston Concrete Pumping Jon T Rich Construction, LLC Joseph J. Albanese Joseph P. Carrara & Sons JPL Concrete Construction Corp K & G Concrete Inc K & K Concrete KAM Concrete Pumping, Inc. KC Concrete Pumping, Inc. KCP Concrete Pumps, Ltd Keim Concrete Pumping, Inc. Kelly Concrete Pumping Kelly's Concrete Pumping, LLC Kent Companies, Inc. Kenyon Noble Ready Mix Co. Keystone Concrete Placement Keystone Gun-Krete, LLC Kienstra Enterprises, Inc. King Concrete Pumping KLS Concrete, Inc. Knight's Redi-Mix Kokosing Construction Co. Kolde Concrete Construction Kong-crete Construction Kriete Group Kurth Concrete Pumping & Belting, LLC Kustom Concrete Pumping, Inc. L & E Concrete Pumping, Inc. L & N Concrete Pumping, LLC L. Guerini Group, Inc. LaHood Construction, Inc. Lakeshore Concrete Pumping, LLC Lancaster Poured Walls, Inc. Landavazo Bros. Inc Largo Concrete, Inc.-Tustin Largo Concrete, Inc.-Upland Larry Santos Construction, Ltd. Last Mountain Concrete Product Lat-Lon, LLC. LaTorre Construction LC Materials, LLC Lewallen Construction Company Liberty Concrete Pumping Liebherr USA, Co., Concrete Technology Division Ligonier Stone & Lime Concrete Company Liquid-Stone Concrete Lloyd Concrete Services, Inc. Longhorn Line Pumps Longoria Construction, dba, Longoria Concrete Pumping Longshot Concrete Pumping Los Angeles Concrete Pumping Louisiana Concrete Pumpers Luther Stem Concrete Pumping M.C. VELAR CONSTRUCTION, CORP. Mack Trucks, Inc. MacKay Construction Services, Inc. Maison Concrete Placement Systems Manotick Concrete Ltd Manotick Concrete, Ltd Maples Pumping, LLC Mardian Concrete Pumping Co.-Flagstaff Mardian Concrete Pumping Co.-Phoenix Mardian Concrete Pumping Co.-Tucson Mark III of Texas, Inc. Marner Concrete Pumping Marsh Creek Concrete, Inc. Martinson Construction Masterlink Concrete Pumping, LLC Matcrete Contracting, Inc. Maverick of Texas Construction, Inc. Mays Concrete, Inc. MCC Pumping LLC McClure Concrete, Inc. McHugh Construction Merli Concrete Pumping Merli Concrete Pumping & Conveying Merli Concrete Pumping & Conveying - San Diego Meyer Concrete Pumping & Conveyor Service, LLC Michel Concrete Construction, Inc. Mid-Atlantic Concrete Pumping, LLC Midstates Concrete Pumping Midwest Concrete Pumping Midwest Concrete Pumping Mill Rental Corp. Miller & Long Company, Inc. Miller Concrete Mitch Schultes MJR Contractors, Ltd Mobile Material Mobile Materials Mobley Concrete Company Modena Concrete Pumping Modern Concrete Pumping Morales Concrete Pumping Morley Construction Company Morris Shea Bridge Company Mountain Park Concrete MudSlide Concrete Pump Primer Multiquip, Inc. Myrtle Pumping LLC Narum Concrete Const., Inc. National Ready Mixed Concrete Assn. NationsBuilders Insurance Services, Inc. Neal Heiser NettPump Concrete, Inc. Noah Concrete Corporation Nomad Concrete Pumping, LLC Norcon Concrete Pumping, Ltd Norman-Spencer Agency North Georgia Pump Company North Pacific Concrete Pumping North River Concrete Pumping, LLC North West Concrete Pumping, Inc. Northeast Concrete Pumping Nuprocon Pumping & Equipment, Inc. Oconee Concrete Pumping Ohana Concrete Pumping Co., Inc. Olin Engineering, Inc. Operating Eng. Local 150 Apprenticeship Original Concrete Pumping Service, Inc. Osburn Concrete Pumping, LLC Osburn Concrete Pumping, LLC Otsego Ready Mix Our Rental Pumps, LLC Outpak Washout P&M Concrete Pumping Inc P. A. Landers, Inc. Parkland Bridge & Concrete Patriot Concrete Pumping Patriot Concrete Pumps Patriot Conveying & Pumping, LLC Peachey's Concrete Pumping, LLC Peak Concrete Pumping PER, Inc Perez Brothers Perfect Filtration Systems, Inc. Performance Concrete Pumping Co. Performance Equipment Rental, LLC Perimeter Concrete Corp. Perma-Structo, Inc. Pete Lien & Sons, Inc. Phillips Companies Phoenix Direct Communications, Inc. Pioneer Concrete & Fuel, Inc. Pioneer Concrete Pumping Pioneer Concrete Pumping Pioneer Concrete Pumping, Inc. Pioneer Concrete Pumps, Ltd Pipe Technology, a Westflex, Inc. Company Pipeline Concrete Pumping, LLC Piqua Transport Co., Pump Division PKS Concrete Pumping, LLC Plycrete Pumping Pool Works, Inc. Poppoff, Inc. Potomac Pumping, LLC Potratz Concrete Pumping South, Inc. Poulson's Concrete Pumping Powertrack International PPT, Inc. PRC Concrete Pumping, Ltd Pre-Mix, Inc. Precision Concrete Pumping, Inc. Precision Concrete Pumping, Inc. Preferred Concrete Pumping, Inc. Preferred Concrete Pumping, Inc. Premier Concrete Pumping Premier Concrete Pumping Prime Time Concrete Pumping ProPump, LLC Pump Parts Plus, Inc. Pumpaction, Inc. Pumpcrete Corporation Pumpcrete, LLC Pung Foundation Putzmeister America, Inc. Putzmeister America, Inc. R & L Concrete Pumping, Inc. R & P Concrete Pumping, LLC R & R Ready Mix, Inc. R. L. McCoy, Inc. R. L. McCoy, Inc. R.M. DuBois Construction, Inc. Rach Concrete Pumping, LLC Ralph's Concrete Pumping, Inc. Ralph's Concrete Pumping, Inc. (Ellensburg) Ralph's Concrete Pumping, Inc. (Portland) Ramcrete, Inc. Rapid Applications Group, LLC Redland Readymix S.A.R.L. Redwood Concrete Pump Redwood Empire Concrete Pumping Equipment Reed Concrete Pumps and Shotcrete Equipment Reidl Construction, LLC Reinert Manufacturing, Inc. 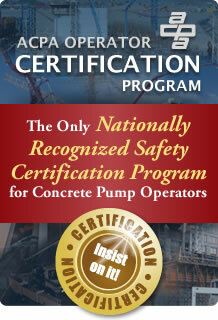 Reliable Concrete Pumping, Inc. Renegade Concrete Pumping Rex Concrete, Inc. Reynolds Concrete Pumping, LLC-Bowling Green Reynolds Concrete Pumping, LLC-Lavergne Reynolds Concrete Pumping, LLC-Lexington Reynolds Concrete Pumping, LLC-Louisville RF Woehrmyer Concrete Construction, Inc. Rhino Concrete Pumping Rick Concrete Pumping Rio Concrete Pumping Risk Services - Leavitt Riverway Contractors, Inc. RJH Concrete, Inc. RK Concrete Pumping RME Concrete Pumpers, Inc. Roanoke Concrete Products Company Rob's Concrete Pumping, Ltd Robert Deluca Rock-It Pumping Ron Hunsche Excavating, Inc. Ron Jordan Concrete Pumping, Inc. Rost Concrete Pumping Rusin Concrete Construction S & F Contractors, Inc. S & I Pump Crete, LLC S & J Concrete Pumping, Inc. S & S Concrete Floors, Inc. S D Matthews Contracting Company S M Borda Contractors Inc S S & L, Inc. S.A.L. Trading Limited S.T.A.R. Concrete Pumping, Inc. S.T.A.R. Concrete Pumping, Inc. Sam's Excavating Unlimted San Diego Concrete Pumping, Inc. Santos Foundations, Inc. Sarnia Concrete Pumping Scales Construction SCD Corp Scenic City Concrete Pumping and Walls LLC Schepers Concrete Construction Schuster Concrete Construction Schwing America, Inc. Seattle Tarp Company, Inc. Semper Fi Concrete Pumping Service, Inc. Senarc Systems LLC Shaw Equipment & Services, Inc. Shenandoah Pumping, LLC Simard Suspensions inc SJM Construction, LLC Skyline Concrete Pumping, Inc. Small Line Concrete Pumping, Inc. Smeco Concrete Pumping, LLC Smelker Concrete Pumping, Inc. Smooth Move, Inc. Smyrna Ready Mix Concrete Pumping Solid Construction, Inc. Solid Ground Concrete Pumping Somero Enterprises South Shore Gunite Pools & Spas, Inc. Southern Cal Concrete Pumping Southern Concrete Pumping Southern Concrete Pumping & Placement, Inc. Southern Oregon Concrete Pumping Southwest Concrete Construction, Inc. Southwest Concrete Pumping, Inc. Southwest Concrete Pumping, Inc. Sparrow Enterprises, Inc. SR Tilley Builders SS Concrete Pumping Stable Ground-Shoring & Caisson, aka, Under Pinners, Inc. Stachler Concrete Pumping, Inc. StahlCo Pumping, Inc. Stalite Structural Lightweight Aggregate Star Concrete Pumpers, Inc. Star Equipment, Ltd State Line Construction Company, Inc. Statewide Concrete Pumping Steffy Concrete Stephens & Smith Construction Co. Stevenson-Weir, Inc. Stillwell Ready Mix & Building Materials, LLC Stonewall Concrete, Inc. Stretch Placement, Ltd Sun Concrete Pumping Company Sun Concrete Pumping Company Sunroc Corporation Sunset Concrete, Inc. Superior Concrete Pumping, LLC Superior Laser Screed Services, Inc SVG Concrete Services Inc. T.A.S Commercial Concrete Const. LLC Tank's Concrete Pumping Taylor-Made Pumping, Inc. TCF Equipment Finance Teague Rental Equipment, LLC Texan Pumpers Company, LLC Thomas Machinery, Inc. Tilt-Up Concrete Association Tim's Concrete Pumping Tipp-Mont, Inc. Toby's Performance Todd Bullis Todd's Redi-Mix Concrete, LLC Todd's Redi-Mix, LLC Tony Doiron's Concrete Pumping Service, Inc. Tor Construction Co., Inc. TPG Concrete Pumping Tri County Concrete Pumping, Inc. Tri-State Concrete Pumping, Inc. Tri-State Pumping, Inc. Tri-States Concrete, Inc. Tri-Way Concrete Pumping, Inc. Tuttle Concrete Pumping, Inc. Union Pumping L.P. US American Concrete Mix, Corporation US American Concrete Mix, Corporation US Boom Inspection USA Concrete Pumping, Inc. USI Insurance Services, LLC Van Laan Concrete Construction, Inc. Vee-Jay Cement Contracting Co., Inc. Verrette Materials Viper Concrete 2000 LP Viper Concrete 2000 LP-Alberta Virginia Concrete Pumping, LLC Vista Ridge Concrete Pumping, Inc. VL Concrete Inc Voss Plumbing & Heating of Painesville, Inc. Waggoner Construction, Inc. Warkentin Concrete Pumping Wayne Priddy WCO Bombas De Concreto Sac Weiler Walls, Inc. Wells Concrete Pumping, LLC Wenning Concrete Pumping West Brothers Concrete Pumping West Fraser Concrete Ltd. West Truckers Franchise, LLC Western Concrete Pumping Western Concrete Pumping, Inc. Western Concrete Pumping-AZ Western Concrete Pumping-CA Western Concrete Pumping-LA Western Concrete Pumping-Lake Charles Western Concrete Pumping-TX Western Concrete Pumping-TX Western Concrete Pumping-TX Western Concrete Pumping-TX Whitehead Concrete Pumping William G. Curth, Inc. Williams & Sons Masonry, Inc. Willmar Concrete Pumping Wisconsin Concrete Pumping Wm L Robinson Concrete Contractors, Inc. Wortman Concrete Pumping Wrightway Pumping Enterprises, Inc. Wuis Brothers Construction, Ltd Zartman Construction Co. Zimmerman Masonry Zoomlion, Managed by CIFA USA, Inc.